In this experiment, we let the forces of nature loose during a bout of deadly wanderings. 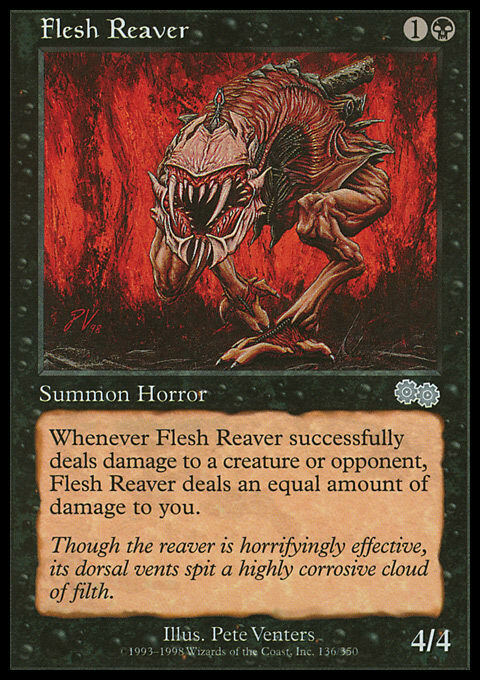 Magic doesn’t feature too many drawbacks on cards nowadays, but back in the day, a couple notable creatures with drawbacks were Force of Nature and Lord of the Pit. Force of Nature required a mana-intensive mana upkeep, and Lord of the Pit required constant sacrifices. If either couldn’t be paid, it would deal substantial damage to the controller. But they’d still stick around. And while taking 8 damage can be substantial, it can be mitigated if we, say, gain 8 life. You know what could make us gain 8 life? Having a creature with 8 power and lifelink deal damage could make us gain 8 life. So, what if our Force of Nature were to have lifelink when we declined to pay ? It would deal us 8 damage that would also cause us to gain 8 life, creating no net change. And then we could attack with the Force, deal another 8 damage—this time to our opponent—and gain another 8 life, this time for a net positive. Green isn’t exactly known for its lifelink powers, so what’s the plan? The obvious color for lifeink is white. We get to play cards like Nearheath Pilgrim, True Conviction, and Noble Purpose (though that last one doesn’t technically grant the lifelink keyword—it’s a triggered variant that works a bit differently). I toyed with some white options for a bit, but the lure of Homicidal Seclusion, Deadly Wanderings, and Whip of Erebos drew me in. The Whip is the most straightforward lifelink-granter we have nowadays—if we want the ability for our whole team—so choosing black seemed straightforward. Deadly Wanderings and Homicidal Seclusion can be very powerful, and they also grant lifelink to our whole team—as long as our “whole team” consists of only a single creature. That adds quite a bit more restriction to our deck-building, but if we’re planning on landing Force of Nature anyway, we shouldn’t need much else. 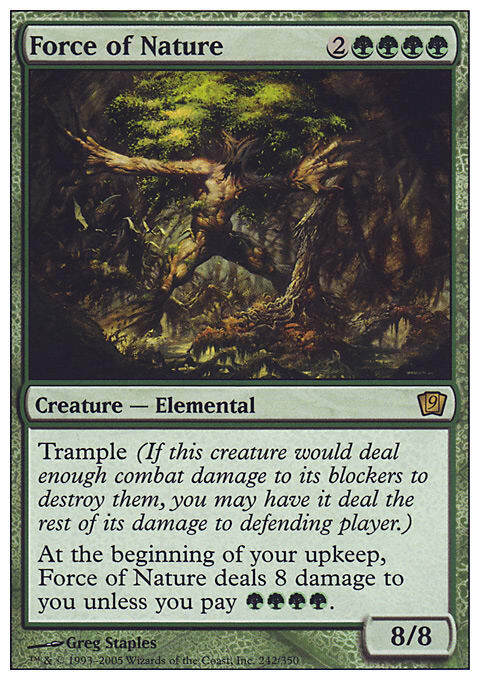 The Force’s trample also works quite well with the deathtouch from Deadly Wanderings—if the Force assigns just 1 damage to a blocker, that’s lethal damage with deathtouch, so the rest of its 10 (or more) power can trample right over to the opponent. I also decided to toss in a couple copies of Vampiric Link. It’s worth noting the massive differences between a card like Vampiric Link and a card like Deadly Wanderings. There are a number of fine-tuned features that distinguish the two. Wanderings gives +2/+0 and trample, while the Link grants a triggered Spirit Link ability rather than lifelink. The lifelink-like ability is really what I’m looking for from both, though, so these features aren’t really what I’m contrasting. Vampiric Link costs only , while Deadly Wanderings costs . 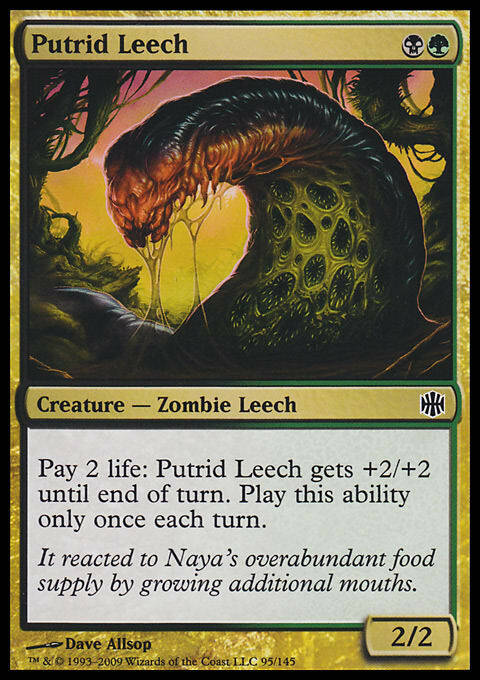 That’s a 4-mana differential, so the Link seems hugely advantaged here. 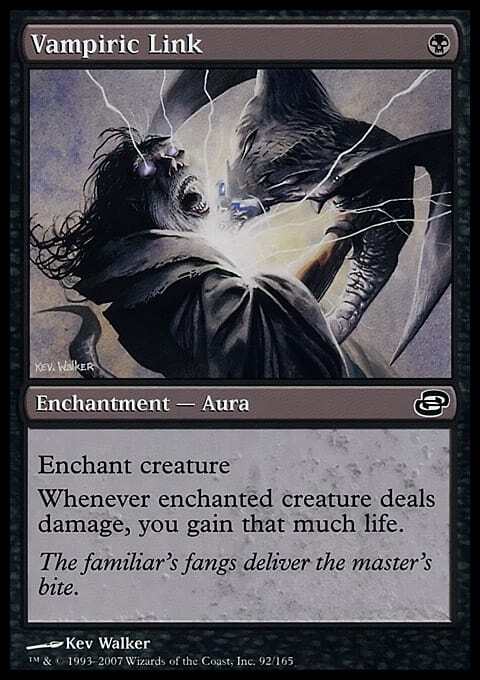 Vampiric Link targets a single creature and only affects that creature. If the creature dies, the Vampiric Link stops working. Contrariwise, Deadly Wanderings can hit the battlefield before a creature, and it will apply to any single creature we have on the battlefield (as long as we only have one). If our creature dies, we can replace the creature and still benefit from the Wanderings. This is the key element that makes us want to play Deadly Wanderings. Even though it’s only 1 mana, the risks of Auras make Vampiric Link a pretty weak card compared to Deadly Wanderings. Deadly Wanderings comes with its own risks, and is much more expensive, but it should be the more powerful card for our deck. With that said, why play Vampiric Link at all? It may even appear redundant with Deadly Wanderings, Homicidal Seclusion, and Whip of Erebos. In fact, it’s the absence of redundancy that is the exact reason to run the Vampiric Links. You see, since it’s a triggered ability instead of actual lifelink, it allows us to double up on life-gain: If Force of Nature hits us for 8 during our upkeep, if it has both lifelink and Vampiric Link, not only will we gain back the 8 life we lose with lifelink, but the Vampiric Link will generate a trigger that gives us another 8 life. So instead of being hit by a drawback during our upkeep, we’ll actually end up with 8 more life. And when we attack and deal damage with the Force, instead of gaining life equal to its power, we’ll gain twice that much. So, yeah, we want to have only one creature, and we want that to be Force of Nature. But we won’t always draw a Force of Nature. And we won’t always have a Deadly Wanderings or Homicidal Seclusion. Lord of the Pit is a reasonable alternative, though it’s a little more expensive and a little smaller. It adds flying to the mix, which is nice, but I decided to go a little cheaper for the Force’s backup. Herald of Torment and Nylea's Emissary — Bestow is the perfect mechanic to pair with the solitary enchantments. 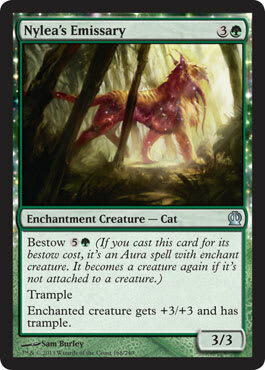 Creatures with bestow are Auras when we already have a creature benefiting from Seclusion or Wanderings, and when that creature dies, or if we’re playing the bestow card to an empty battlefield, we have a creature mode to work with. The Herald of Torment is more aggressively costed, so we’ll play all we can of these. Nylea's Emissary is more costly and less evasive in both modes, but the trample works well with Deadly Wanderings’s deathtouch. 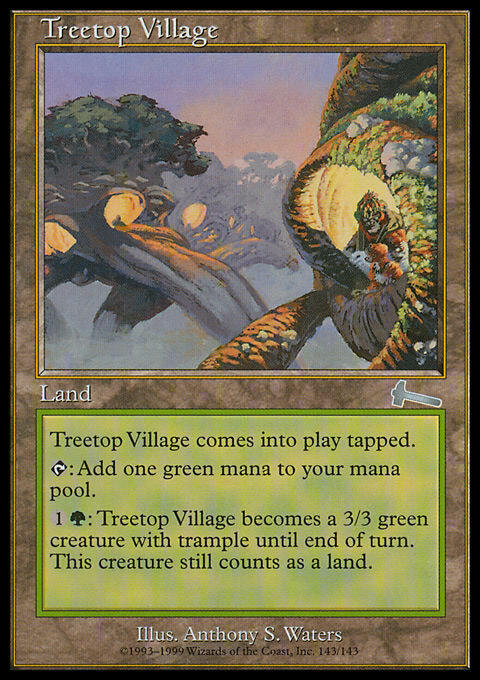 Treetop Village — I often don’t discuss the lands I include in my decks. I try to build good mana bases tailored to the decks in question, so they’re worth taking a look at, but your collection may vary, and the lands aren’t the synergistic, combo-tastic elements of the deck to get excited about. But here, Treetop Village is part of the synergy. With a Homicidal Seclusion but no creature to attack with, we can animate the Village and attack with a 6/4 lifelink Ape. We can even follow it up after combat with a creature to attack with on the following turn—and if that creature dies before then, we can resort to the fallback Village again. Harmonize and Cultivate round out the deck. If you want to play a version without the seclusion subtheme, and perhaps going with full Abzan colors, try Elves of Deep Shadow and Noble Purpose alongside Whip of Erebos—the Elves will actually gain you life while they generate mana! If you haven’t used your Force of Nature in a while, if you love lifelink as much as I do, or if you just like the idea of turning drawbacks on their heads, give this deck a try.